Brenda Wong Aoki is a storyteller, anthologized playwright, producer, artistic director, and performer. 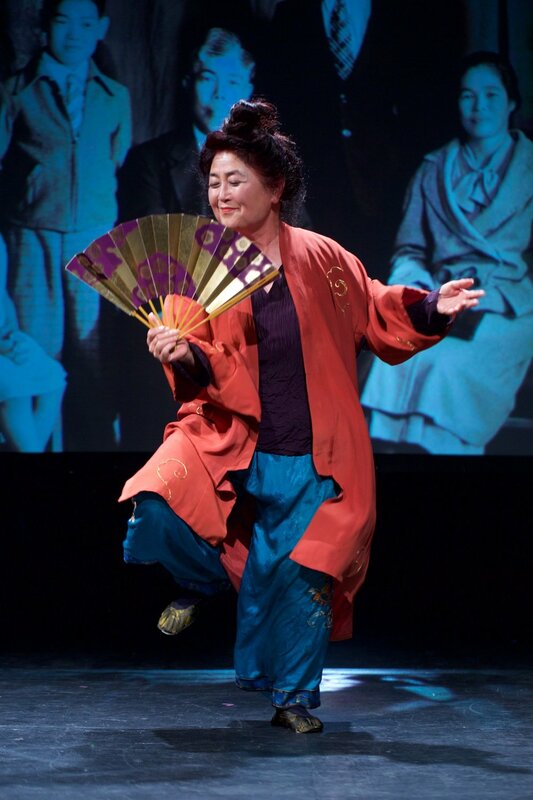 Her song/dance/dramas are drawn from her family’s 121-year history in San Francisco and the Bay Area, Kabuki legends, ghost stories, and her personal experience. Known for her agility across disciplines, she creates monodramas rooted in traditional storytelling, dance movement, and music. Her sensei is Living Treasure, Nomura Mansaku, a Kyogen master; she also studied Noh with Nomura Shiro, who is a Cultural Intangible Property. It is extremely rare for a woman (and especially an American woman) to get to study with masters like these; ironically, it is because she is an American that she was able to work with artists of this caliber. 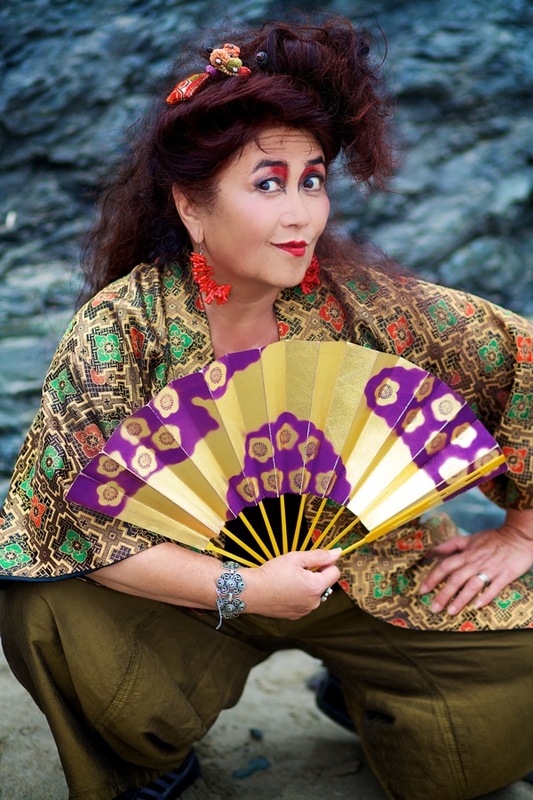 Her other teachers/coaches/mentors include stage director, choreographer, performer, and former director of Theatre of Yugen, Yuriko Doi, and longtime director and coach, Jael Weisman of Dell’Arte Players and the San Francisco Mime Troupe. Aoki’s work combines Eastern and Western narratives and theatrical traditions such as noh, kyogen, commedia dell’arte, modern dance, Japanese drumming, and American jazz. Most of her performances express themes of history, mixed race, home, gender, and mythology. Her multi-disciplinary works include: Aunt Lily’s Flowerbook: 100 Years of Legalized Racism (2017), presented as part of the San Francisco International Arts Festival Fort Mason Center for the Arts; Suite J-Town (2015) an 18-month multigenerational, multicultural, interdisciplinary festival of events and exhibits celebrating the 110-year history of Japantown; MU (2013), presented at the Jewish Community Center San Francisco and the Krannert Center for The Arts at the University Of Illinois, Urbana and the McCallum Theater in Palm Desert; The Most Beautiful Girl in the World (2012), for two dancers, sho and storyteller, presented at the San Francisco Conservatory of Music; When the Catfish Dances (2011), commemorating the Tsunami and disaster in Japan for KQED TV; The Queen’s Garden (1992, 2011), presented by Climate Theater and San Diego Repertory Theater and published in Contemporary Plays by Women of Color (Routledge Press, London); Legend of Morning Glory (2009), a play for dance, storyteller and taiko ensemble based on a story given to Aoki by Pete Seeger; Return of the Sun (2009), a work commissioned by the Ethnic Dance Festival and created for dance ensembles from Korea, India, Peru, and Mexico presented at the Palace of Fine Arts in San Francisco; Uncle Gunjiro’s Girlfriend (1998, 2002, 2007), developed at San Jose Repertory Theatre, originally directed by Diane Rodriguez with dramaturgical support from Luis Alfaro and Joan Holden, produced by the Dell’Arte Players and the American representative to the Adelaide International Festival in Australia, and featured in the KTVU documentary, San Francisco in the 1920’s; Obake: Tales of Spirits Past and Present (1998, 2005), presented at the Kennedy Center and on Broadway at the New Victory Theater; Mermaid (1997), performed by the Torrance and Berkeley Symphonies, commissioned by Kent Nagano; Kuan-yin: Our Lady of Compassion (2002), performed at the Hong Kong Cultural Center, Yerba Buena Center for the Arts, the Esplanade in Singapore, directed by Shu Wing Tang and featuring gagaku master Togi Suenobu; Random Acts (1994), presented at the Dallas Theater Center and other national touring venues; and The Soul of the Great Bell (1985), presented at the Montgomery Theater with San Jose Taiko. 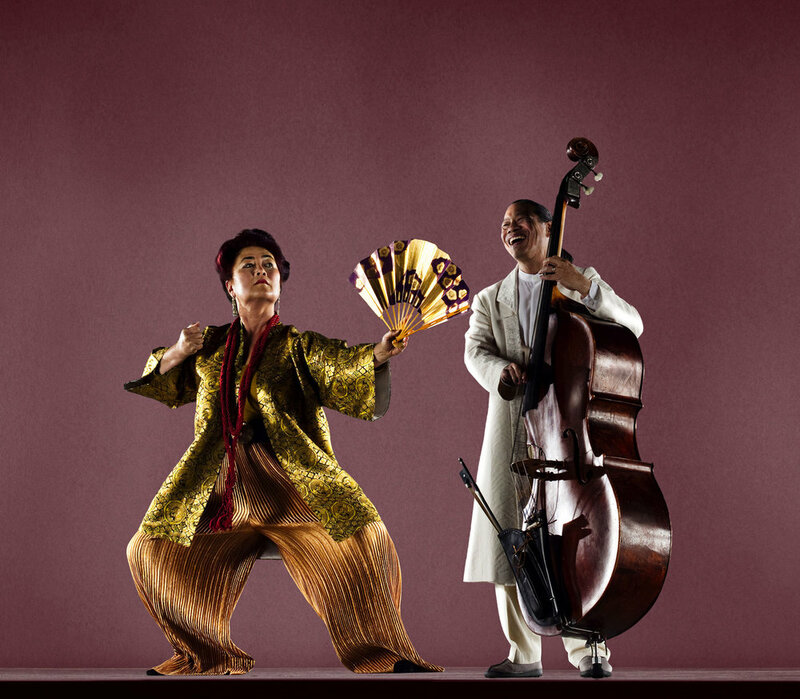 All of Aoki’s work incorporates live music composed by her partner, Mark Izu, with whom she co-founded First Voice, a nonprofit organization, in 1997; Aoki and Izu’s Kabuki Cabarets (2010, 2011) were presented at the San Jose Jazz Festival, Kuumbwa, and Yoshi’s San Francisco. A curriculum developer and educator, Aoki is a founding faculty member of the Institute for Diversity in the Arts at Stanford University and has been an artist in residence at such institutions as the Smithsonian, Duke University, Kenyon College, Wesleyan, Oberlin College, International House, Tokyo, and Sapporo University. Her plays are archived at the University of Massachusetts, Amherst. She is a member of ASCAP and the Dramatist Guild. She is the co-founder and artistic director of First Voice and currently is a board member of California Humanities. Aoki has been awarded a Critic’s Circle Award, four Hollywood Drama-logue awards, ASCAP Plus Awards, two INDIE Awards for best spoken-word recording. In 2013, she received the Inspirational Leadership in the Performing Arts award from San Francisco Mayor Ed Lee. Her plays have been commissioned and supported by the U.S. Congressional Civil Liberties Public Education Fund, Dramatists Guild, the Asian Arts Council, the Japan Foundation, MAP Fund, the San Francisco Arts Commission, the California Arts Council, the Zellerbach Family Foundation, the Rockefeller Foundation, the National Endowment for the Arts, and the Wallace Alexander Gerbode Foundation. She and Izu were the first Wattis Artists-in-Residence at Yerba Buena Center for the Arts in 1999. Emmy winning musician Mark Izu accompanies his wife and "America's foremost Asian storyteller" Brenda Wong Aoki to share touching and personal family histories with universal and contemporary appeal. The two acclaimed artists weave memories recorded in a recently discovered family diary with further flourish, story and song tracking over 100 years of history in the American West. From the Transcontinental Railroad, to WWII's Japanese American internment camps and 442nd Infantry Regiment, to San Francisco hippies and through today. Joined by koto master Shoko Hikage, the performance offer a poignant glimpse of our shared history and demands it not be repeated. 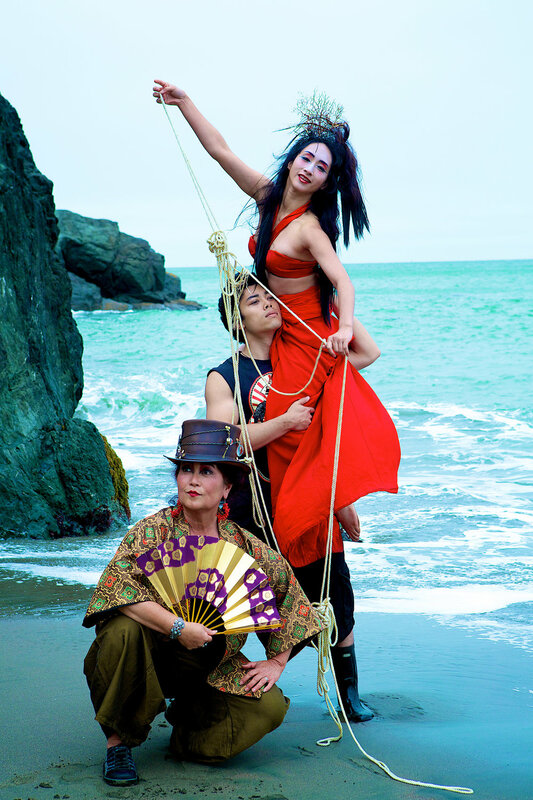 Aoki’s honors include the San Francisco’s 2013 Inspirational Leadership in the Performing Arts award, a US-Japan Creative Artist Fellowship, two NEA Solo Theater Fellowships, ASCAP Plus Awards, Critic’s Circle Award, Hollywood Drama-logue awards and AFIM INDIE Awards for Best Spoken Word recordings. Her work has been commissioned by the US Congressional Civil Liberties Public Education Fund, Asian Arts Council, Japan Foundation, MAP Fund, Dramatist Guild, SF Arts Commission, California Arts Council, Zellerbach Foundation, Rockefeller Foundation and National Endowment for the Arts.